January is National School Board Recognition Month and an opportunity for local schools and communities to honor Oklahoma’s more than 2,700 elected school board members for their dedication to children and schools. Ponca City Public School board members were honored at their January meeting. Board members were presented with lots of items from school employees and students, including gift baskets with a variety of items, such as candy, ball caps, T-Shirts, stainless steel water bottles, personalized tumblers, coffee mugs, calendars and cards, homemade goodies and other items. They were also presented with a Certificate of Appreciation from the Oklahoma State School Board Association for their dedicated service. “These ladies and gentlemen bring a great deal of knowledge and experience to the table. They question, bring ideas, offer suggestions from different perspectives, challenge me to grow as a leader, and truly are wonderful assets to the district. These folks make a five-year commitment when elected or appointed to the board and spend countless volunteer hours serving this district. There are many hours of behind-the-scene work other than a two to three hour BOE meeting the second Monday of each month. Their job entails an endless string of meetings and school functions to attend; reams of reports, agendas, proposals and other information to read and study; and a host of difficult decisions to make. They also work hard at seminars and training sessions to keep abreast of the latest trends in educational leadership, are deeply involved in community activities and spend many hours in the schools and at extracurricular events. Don Nuzum: The current board president is Don Nuzum. Don is the manager of the Ponca City Airport and is our longest standing board member, serving since 1999. He has served as the president of the board 13 times and serves on the board finance and property committees. 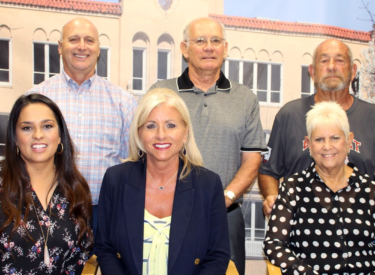 Nuzum is the past recipient of the OSSBA Platinum Excellence Award, which is designed to recognize the time and commitment made by board members. He is the voice of experience on the board and has a great deal of knowledge about the operations and finances of the district. He works diligently to best serve the students and the district. Robin Riley: Robin Riley is the current board vice president. He is a retired Conoco employee and was appointed in 2012 when there was a mid-term opening on the board. He serves on the finance committee and has been the president of the board one time and will serve as president again beginning in April of 2019. Robin is a PCPS graduate and spends many hours learning, reviewing, discussing, and asking questions regarding all areas to ensure that school officials continually grow and improve as a district. It is obvious he has the best interest of the district and students as his main goal. Judy Throop: Board member Judy Throop is a retired, longtime PCPS teacher and was elected to the board in 2004. She serves on the curriculum committee, has been board president twice, and was elected as OSSBA Region 3 Director, serving Garfield, Grant, Kay, Noble, Pawnee, and Payne Counties. Throop’s perspective as a former educator makes her an invaluable member of the board because she understands the learning and teaching process and strives to improve all aspects of student learning.